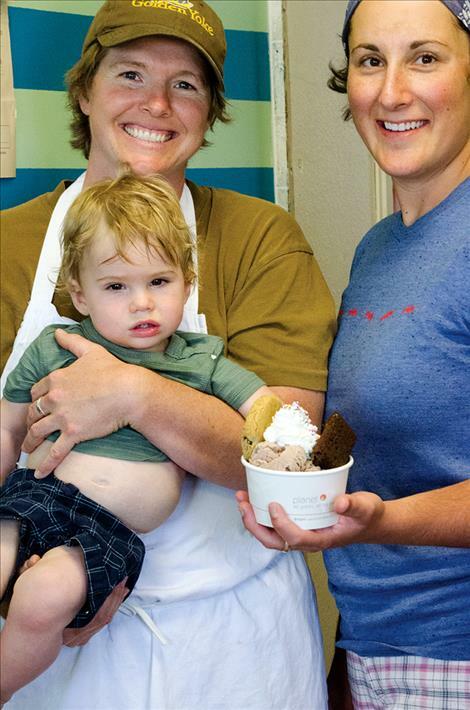 Connie Surber, Laura Ginsburg, and Finn Surber-Ginsburg sell ice cream at their new shop. 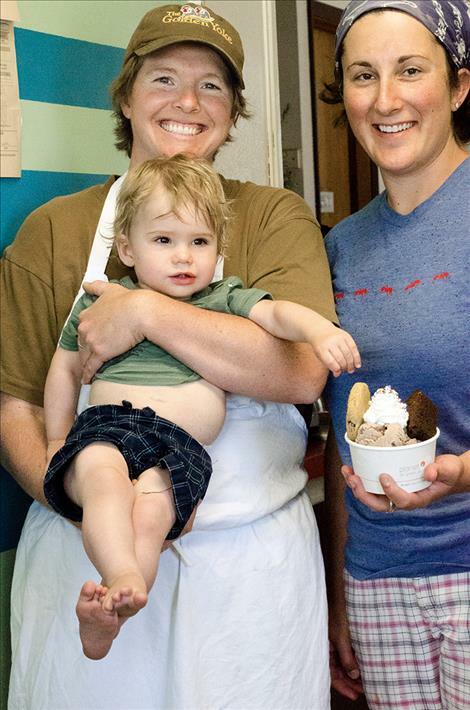 ST. IGNATIUS – Getting started in the ice cream business wasn’t an easy task for the owners of the Golden Yoke, but they made it happen. Connie Surber and Laura Ginsburg originally wanted to purchase a pasteurizing machine to make ice cream with milk from their farm. They started working on a plan to make that happen in 2013, which included, for Surber, a journey to Penn State to attend ice cream school. She already had a degree in dairy science. “The dream was to eventually hand milk cows at our place, but there turned out to be too many regulations,” Surber said. Montana rules and regulations require the use of special equipment to milk cows when the milk is being sold for public consumption, so hand milking the cows was out. “We would have to put in a certified milking facility with a lot of regulations to become a milk handling facility,” Ginsburg said. And they could have built such a facility, but instead of selling an ice cream sandwich for $4, the price would be closer to $20 to cover costs. “It was disappointing, but we needed to keep costs down,” Ginsburg said. The next plan involved buying pasteurized milk and cream, but that process also proved to be difficult and time consuming. 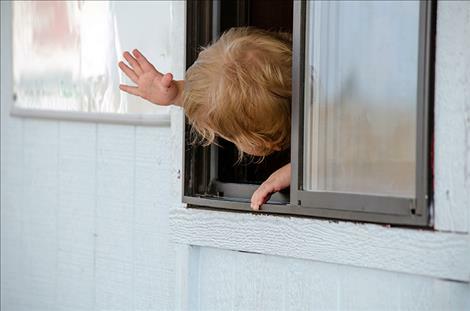 The freshly painted shop, sitting between U.S. Highway 93 and Mountain View Drive, remained closed for about a year while a new plan was worked out. Finally, they decided to buy an ice cream mix in an effort to get the business going. 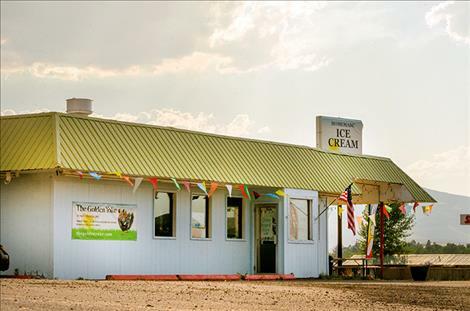 They also wanted to deliver ice cream to other businesses through the Western Montana Growers Cooperative. Once the base for the ice cream was figured out, they created batches of specialty flavors with things like fruit from local farms including a Glacier Tilth Strawberry creation. 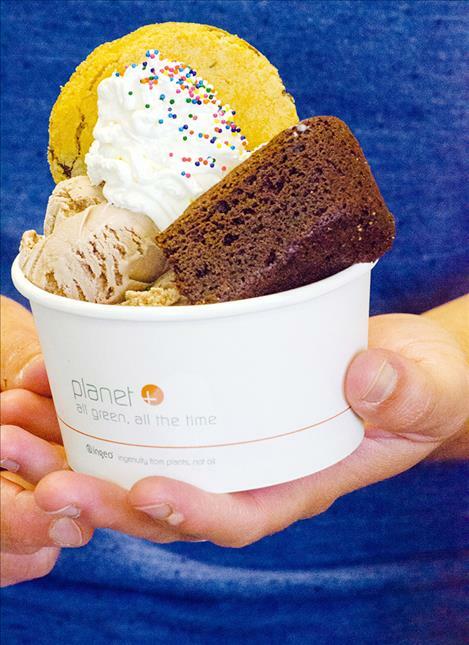 Traditional flavors are also on the menu, and all the baked goods and sauces are made in-house including the chocolate fudge, chocolate syrup, brownies, and cookies mixed up in sundaes, sandwiches and pints. Gallons are available by special order. Customers from near and far have stopped by the shop including a team of cyclists on their bikes from Portland. 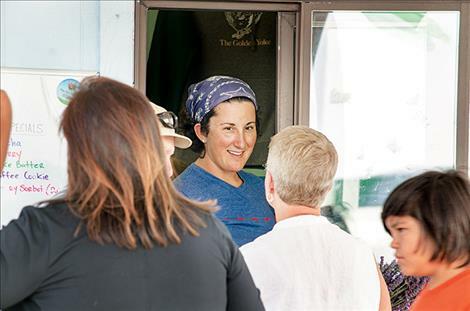 “We’ve had a variety of folks stop in from the irrigator filthy and wet from working hard out in the field to a person in a Mercedes,” Ginsburg said. And just to be clear, the shop isn’t named after an egg. This yoke is a wooden crosspiece fastened over the necks of animals. “It’s symbolic of hard work and teamwork,” Ginsburg said. The couple also has a family farm called the Golden Yoke Farm, and chickens were the first animals they made money on, which is why a pair of chickens are on the logo packing a yoke. 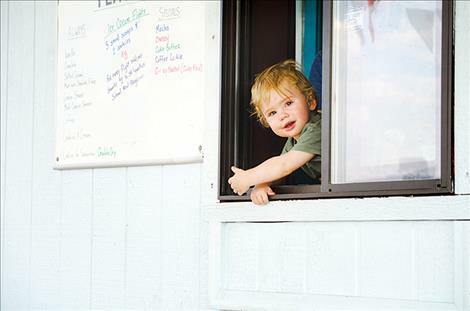 The business plan changed in the past couple years, but the owners always planned to be good neighbors. During their son’s first birthday, they created a fundraiser to bring in money for the Jadyn Fred Foundation to provide assistance for kids with medical needs. 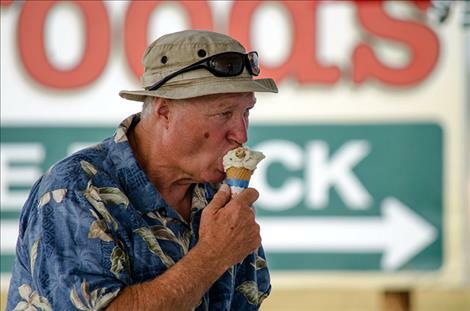 They also donated ice cream to the Fireman’s Picnic. And they are currently selling a creation called Friday Night Flights with five different scoops of ice cream and two cookies, which is available now. A portion of the sales will go to a local nonprofit that supports kids. The shop is open from 2-8 p.m. Tuesday, Wednesday, and Thursday, 2-9 p.m. Friday, 12-9 p.m. Saturday and 12-8 p.m. on Sunday. More information is available on their Facebook page. As of now, they plan to close for the season in September.